French Open champion Rafael Nadal stormed into the Cincinnati Open quarter-finals with straight-set victory over fellow Spaniard Albert Ramos.Nadal shall be taking on Australia's hard-hitting baseliner Kyrgrios in the quarterfinals. 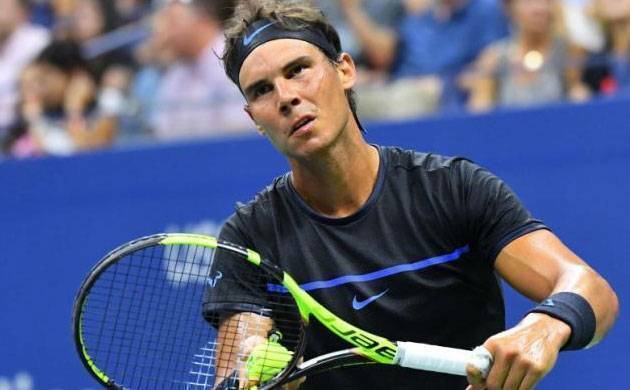 French Open champion Rafael Nadal stormed into the Cincinnati Open quarter-finals with straight-set victory over fellow Spaniard Albert Ramos. Nadal shall be taking on Australia's hard-hitting baseliner Kyrgrios in the quarterfinals. Both players were wearing black ribbons on their shirts in memory of the victims of the attacks that took place in Barcelona and Cambrils on Thursday. Nadal, 31, won 7-6 (7-1) 6-2 to set up a quarter-final tie with Australia's Nick Kyrgrios. Kyrgrios and Nadal will play their quarterfinal match later on Friday (not before 02:00 BST on Saturday). Roger Federer's withdrawal from the tournament means Nadal will return to world number one for the first time since July 2014, taking over from Andy Murray who is also injured. Meanwhile, Karolina Pliskova solidified her world number one ranking by beating Camila Giorgi and Caroline Wozniacki. The Czech defending champion beat Italian qualifier Giorgi 6-3 4-6 6-0 in their third-round match, before defeating world number five Wozniacki of Denmark 6-2 6-4 in a schedule reshuffled after Thursday's rain delays. The 25-year-old now faces Spain's Garbine Muguruza in the last four. Wimbledon champion Muguruza beat Russian eighth seed Svetlana Kuznetsova 6-2 5-7 7-5 and also made a special tribute to victims of the attacks in her country's Catalonia region. She wore a black ribbon in her headwear and later posted on Instagram: "Barcelona I feel you." Pliskova's victory over Wozniacki means world number two Simona Halep is only able to overtake her as world number one if she wins the title. Romania's Halep plays Britain's Johanna Konta, who has won each of their three previous meetings, in their quarter-final tie later on Friday (not before 00:00 BST on Saturday). Meanwhile, Ukraine's world number four Elina Svitolina, who was in with a chance of becoming world number one if she had won the title, was beaten by Germany's Julia Goerges 7-5 6-4 in their third-round match. Goerges goes on to play American Sloane Stephens, who eliminated Russia's Ekaterina Makarova 2-6 6-3 6-4, later on Friday.